When you are passionate about hunting, you care precisely with your gear! Your hunting skills are essential, but your performance is partly dependent on the gear you use. Hunting on rugged surfaces or muddy areas requires intense outsole traction and secure snug fit for your feet. To make your hunting experience enjoyable, you need to choose among the best rubber boots found in the market. Rubber boots are significant despite the intensity of your activity. Great rubber boots will keep you going on a long day of hunting with zeal. Though rubber boots are essentially waterproof, customers must be meticulous when it comes to the core of the boots. This list of factors will help you know how a rubber boot can significantly increase your hunting performance. This part of the boots covers your feet from the soles. Manufacturers may choose between rubber, neoprene, or the combination of the two. The natural rubber has a configuration to resist water, bases, acids, and other liquid solution you may encounter outdoors. However, it cannot resist petroleum-based and oil-based solvents. It is also resistant to cuts and punctures which are prominent for outdoor activities. Neoprene is a synthetic rubber which caters the resistance problem of a natural rubber against oils. Still, it is resistant to most chemicals and liquids. It is also resistant to cuts, punctures, and abrasions. Neoprene is lightweight and has insulation properties. Insoles are sometimes referred by manufacturers as footbed. Manufacturers design the insoles to be removable. This is a great feature if you love the boots except for the insoles. In case the insoles won’t give you the utmost comfort and support you need, you may opt for another insole. Choosing the right insole is another story, though. The midsoles of the boots are directly responsible for boot stability, weight dispersion, and shock absorption. Midsoles with steel shanks are ideal for hunting activities. Steel shanks deliver an optimal stiffness and support for the bottom of the boots. Some manufacturers use fiberglass shanks to make the weight of the boot lighter. An ideal outsole for hunting is the one made from durable molded rubber. However, the lugs and cleats on the outsoles matter significantly. When lugs and cleats are properly designed, it provides more traction and helps shed more mud. Self-cleaning outsoles is also an ideal feature. Self-cleaning cleaning outsoles have the capability to resist adhesion of foreign materials. In case the outsoles are not resistant to adhesion, it also drops the traction capability. 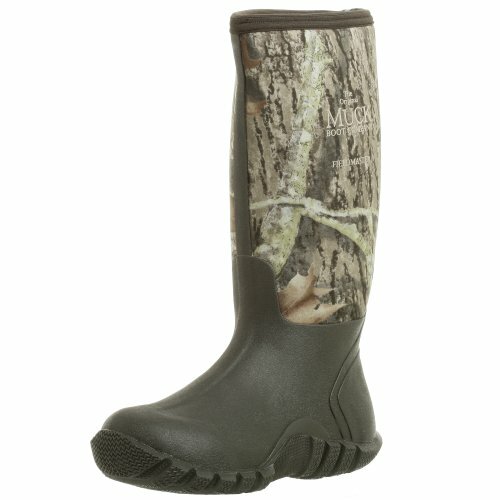 Hunting rubber boots generally have a camouflage pattern to help you disguise. It is also configured to be scent-free to prevent a traceable trail. When the boots are made for hunting, expect it to be totally waterproof. 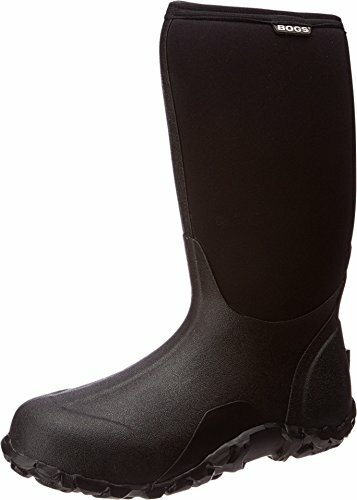 All-purpose rubber boots cater varied outdoors activities such as ranching, farming, hunting, and other activities which need prevention from cold weather. Thus, all-purpose boots are significantly insulated to keep your feet warm. Some manufacturers opt to combine the pros of these two types of rubber boots. Rubber boots on the market usually have a 6” to 18” shaft length. If the terrain you are going to explore have deeper waters and deeper muds, you have to consider buying higher shaft length. If you are not a total expert of the terrain, longer shaft length is safer to buy though you may need more money. Rubber is commendable to keep the boots totally resistant to water. The competition between manufacturers begins as they embed their carefully chosen features to the rubber boots. 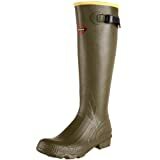 To help you decide, this list of top 5 rubber boots were carefully reviewed for you. Hunting on any terrain and climate becomes more exciting with The Original Muck Boots FieldBlazer. This boots will keep you protected whether you are in a swamp, mud, or slush. You’ll experience waterproof comfort in spite of worse natural conditions. The outsole of this boots uses slip-resistant rubber material. Traction is maintained even on rugged surfaces. It is aggressive enough to pursue maximum traction and protection with its self-cleaning feature. Self-cleaning outsoles have high resistance against adhesion to foreign materials. You need to keep your feet warm particularly when hunting on cold climates. Thus, this boots features a stretch-fit topline binding to ensure a snug fit at all times. Also, boot flexibility matters a lot. Hence, this boots uses CR flex-foam. It has a four-way stretch nylon to ensure maximum comfort and support. This boot utilizes an Airmesh lining to sustain breathability when you are using it. It is also equipped with wrap-up toe bumper to ensure further protection against scrapes and stubs. And to support your feet optimally, this boots is designed with an extra Achilles overlay and shank reinforcement. Both of my heels have blisters now. I’ve used socks specialized for athletes. Maybe I need to reconsider my socks carefully. Also, my feet is sweating while I’m using this boots. Sweating might contribute more to my blisters. The Original Muck Boots FieldBlazer is perfectly designed for the people who loves outdoor activities. If you are a woman hunter, you’ll be delighted as this boots are manufactured with woman sizes too. Be satisfied with hunting comfort through Baffin’s Hunter Waterproof Boots. Regardless of the intensity of your outdoor activity, this boots optimizes protection with warmth and flexibility. This boot is made with a thermoplastic rubber compound. This material is known to keep the boots lightweight and flexible at the same time. The base of this boots is made with a premium rubber outsole that intensifies self-cleaning characteristics and high resistance to wear. As you prevent adhesion of foreign materials, you also obtain an increased outsole life. 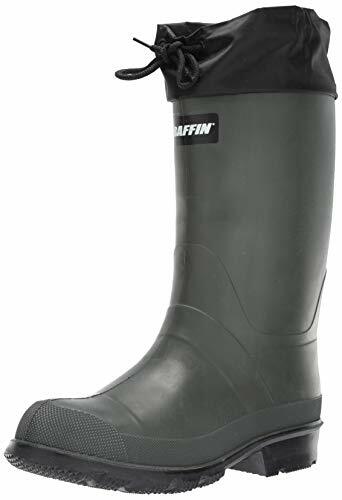 Baffin delivers high performance through integrating an 8-layer removable foam-based inner boot system. Since it is composed of 8 layers, it intensifies warmth, fit, and comfort throughout your use. The sole of this boot is a product of Baffin’s careful design as it features advanced thermoset polymers for you to receive the right warmth, protection, weight, and grip. When these polymers are combined with an open-cell Polymech foam, Timberwolf leather, and Diamond-Lite nylon uppers, your feet will be able to withstand up to its rated -40℉ temperature. The size list is deceptive. Shoes are way too oversized. I tried ordering a size down, still oversize. I’m quite contented on another size down, but there is still somehow a space left inside the boots. I’m wondering if three sizes down will make me fully contented. Baffin is focused on manufacturing boots with proper functionality and styles amidst your high-performance needs. LaCrosse Grange Boots remains to be reliable since 1957. This boots still remains to be alive and built for high performance regardless of your hunting conditions. When you are in a very thick mud, this boots delivers more traction through its Chevron-Cleated outsole. This outsole ensures additional durability as it is made with full vulcanization. LaCrosse also designed it carefully to keep the mud shed constantly. Lesser mud leads to more traction, and this will empower your performance in muddy conditions. With the Ankle-Fit Technology, you’ll receive a secure and snug fit around your ankle. Also, the top of your foot and your heel is well-fitted which prevents the boot from becoming loose as you go deeper through the mud. Along with comfort and security, quality is assured by LaCrosse as they stay committed to producing handmade rubbers. The footbed is made with EVA (ethylene vinyl acetate) foams. EVA is a closed-cell foam which keeps the footbed soft, flexible, and thermally-insulated. The footbed is removable in case you prefer to use another LaCrosse footbed. Still, this integrated footbed has low water absorption which makes the overall waterproof property continuous for this boots. I’ve been using this same boots years ago. However, the quality has changed. The same boots I ordered years ago can last for at least 2 years. But now, holes starts to show in just 6 months. Higher price yet cheaper quality. Also, the smell is disgusting. These boots offer mild comfort with a rating of 0 to 70℉ usability. Likewise, LaCrosse ensures its boots won’t let you down. Rutmaster 2.0 is packed with varying technologies to optimize your hunting performance. With ScentBan™, the scent is controlled within the boots. You must not worry about a smelly foot after using this boots. ScentBan™ technology is integrated within the leather, lining, and footbed. The weight of this boots is significantly reduced through RPM™ composite technology. Though the weight is reduced, comfort and endurance are still assured with this boots. Also, this boots is carefully designed to provide durability and strength regardless of weight. The back of your foot is significant when using boots. Irish Setter integrates its ExoFlex® technology which allows the boot to expand until the back of your foot is well-accommodated. Once your feet is inside the boots, it contracts to make the fit tighter. This improves performance and agility on your motion. To keep your feet warm, this boots is designed with Primaloft® Gold insulation. Primaloft® Gold is made from recycled fibers and compressed repeatedly. Along with water-repellent treatment, your feet will experience warmth regardless of the temperature. It’s a pain to put on or put off this boots. It’s a tight fit around the ankle. Though this is an advantage when walking through mud, but comfort is hardly achieved especially on longer use. The Mossy Oak® Break-Up Country® design makes this boots fascinating. It uses limbs, leaves, barks, branches, and other elements to keep you camouflaged within the terrain. Bogs ensure durability within the rubber to keep your dry and comfortable amidst harsh conditions. 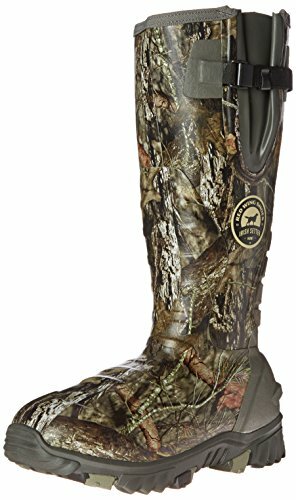 This boot is designed to be used for all your outdoor needs, including hunting. Through proper contours, this boots will fit well on your feet with enhanced motion support. Its non-slip, non-marking, and self-cleaning outsole will keep you going for a long day. Because rubber boots are essentially waterproof, this boots is designed to keep you protected from any natural elements in any season. With Bogs Neo-Tech™ insulation, you will get the warmth and comfort you need. The insulation is optimized with a four-way stretch inner bootie. This boot is rated to provide utmost comfort with their -40℉ rating. Thus, this makes the boots essential to living its name as “rain boots”. Smelly feet must not annoy you after a long adventure. With DuraFresh Biotechnology, the inners of your boots have the capability to attack every odor-causing bacteria. I don’t believe their -40℉ rating. I’m using it while the temperature is on 25℉. My feet feel so cold that it numbs in less than an hour. I think it’s better to go home and take off this boots immediately. It kills the fun though. Though these boots were designed for all purpose, it still reliable for your hunting needs. Bogs Men’s Classic Boots is ready to meet all your outdoor needs. When you have the best rubber boots, your outdoor adventure won’t get disrupted with the disruptive cold weather, lesser mobility in muddy tracks, and wet feet. It is important to choose the right rubber boots for you to optimally enjoy your hunting activity. Let nothing limit your hunting performance. With your skills paired with the right gear, you have a long day to expose your maximum potential.